Businessman and National List MP Malik Samarawickrama, a Minister in the current Government who is spearheading the Free Trade Arrangements (FTA) with India, China and now Singapore, stated that all the FTAs in the pipeline would give investors access to three billion people. This sounds very impressive on paper, but as we all know very little work is happening at ground level to get the country ready for such an explosion in trade and investment. Investors don’t simply invest because they have access to markets. True, investors are attracted to emerging markets looking for markets to sell more goods, but they also need to have access to raw materials, managerial knowledge, superior technology, good soft and hard infrastructure and they also look for countries where the factors of production are competitive. Investors look for the perfect mix of these factors in answering the “where to invest?” question. While labour costs and attributes of the workforce such as skill and educational levels are critical variables for investment decisions (the Ireland Experience), the purchasing power of the market and proximity to other markets are taken into consideration in taking the investment decision. Additionally, the type of investment such as joint ventures or wholly-owned subsidiaries critically affects investment decisions. Therefore, skills, market size and growth prospects of the host country, the availability of soft and hard infrastructure, reasonable levels of taxation and the overall stability of the tax regime, stable political environment, as well as conditions that support physical and personal security, legal framework and the rule of law and corruption and governance concerns constitute the main concerns of investors in taking their decisions in developing countries. The openness of the host country to international trade is certainly a key factor that affects investment decisions of investors, which allows the companies to export their final product to alternative markets easily without limiting their sales operations within the host country market. Foreign investors certainly prefer countries that trade more with the rest of the world, but that alone is not sufficient to attract good FDI. Investors finally put far more emphasis on the investment environment, regulatory framework and on the political risks. Many top MNCs have set up operations in the Asian region to take advantage of the low wage levels and to benefit from the liberalisation of the economies of these countries while countries such as Brazil, Indonesia, and Mexico have been able to maintain a significant level of FDI inflows as a result of large domestic markets, rich natural resources, and moderate economic growth even with restrictive foreign investment regimes. Countries like Vietnam and Bangladesh to attract more FDI have invested to build pools of talent by even allowing expatriates to come in and invested in research facilities to facilitate innovation. The question that is often asked by investors is ‘Why invest in Sri Lanka?’ Is it skills, location, advanced manufacturing, quality financial and business services, fast internet, ease of doing business, superior soft and hard infrastructure? 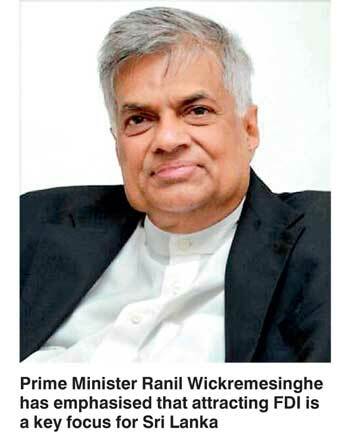 The goal for us must be to position Sri Lanka to be the first in the world in South Asia for inward investment. Countries generally develop their own strategies based on their comparative advantageous, such as available skilled labour, ease of doing business, level of innovation, R&D facilities, population, access to markets, services, infrastructure and wage-adjusted labour productivity; while some countries focus on investors who are looking for enhanced infrastructure rather than their costs in influencing FDI location decisions. Fiscal incentives constitute the other type of influential tools to attract FDI. The incentives such as tax breaks and tax holidays, favourable utility usage fees, reduced custom duties and foreign exchange restrictions, relaxed ownership controls, and streamlined administrative procedures aim to create the best place in terms of FDI attractiveness. Additionally, there has been the development of zones under an overall national strategy. These zones have been employed to bring in labour-intensive manufacturing activities to absorb surplus labour, to experiment with a policy instrument that has not been used before. There are many other considerations that MNCs take into account such as increased competitive intensity at the original location, cost-cutting requirements which prompt the search for new low-cost production locations, or pressure to enter new markets in response to similar moves by rivals. In the final analysis, the people tasked by the Prime Minister to attract $ 2 billion a year, for a start need to know what our rivals in South Asia are doing to attract FDI in to their countries and also look to a country like Ireland that is home to over 1,200 oversees companies for some inspiration to understand how they continue to attract companies from sectors such as ICT, life sciences, financial services, internet, manufacturing, engineering and business services.